Our last strike on March 26 was again solidly supported, despite the fact that the NASUWT leadership decided, regrettably, that their members would not be taking action alongside us. However, Gove has still not budged. He still insists that any talks can only be about “implementing” his policies. Pension contributions went up again in April. This summer, schools may start to block pay progression using the imposed performance pay legislation. Workload and the stress of tests, targets and observations only gets worse. We’ve got a clear choice to make. Do we just accept defeat and allow things to get even worse? Surely, the answer has to be NO. If we do, then even more colleagues will resign or be driven out of a profession that they once loved. Conditions for teachers - and for our students - will deteriorate. So, the only choice is surely to step up our action so that Cameron and Gove - and all of the political parties - have to take notice of what teachers are saying about the damage being done to education. It doesn’t look like the NASUWT are making that choice at present, so the NUT needs to find other allies to work with - while trying to persuade our NASUWT and ATL colleagues to come on board too. Those allies can be our support staff colleagues who work so well with us in our schools - and whose unions - UNISON, GMB and UNITE - are now going to be balloting them for strike action over pay. 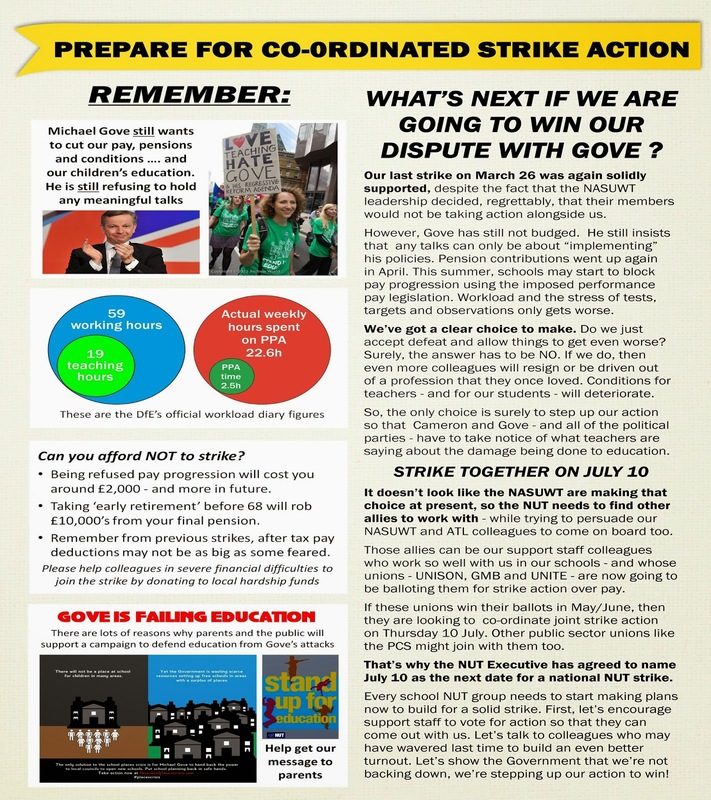 If these unions win their ballots in May/June, then they are looking to co-ordinate joint strike action on Thursday 10 July. Other public sector unions like the PCS might join with them too. That’s why the NUT Executive has agreed to name July 10 as the next date for a national NUT strike. Every school NUT group needs to start making plans now to build for a solid strike. First, let’s encourage support staff to vote for action so that they can come out with us. Let’s talk to colleagues who may have wavered last time to build an even better turnout. Let’s show the Government that we’re not backing down, we’re stepping up our action to win!